For Immediate Release, Atlanta, GA – The TADA Pro-Team performed live on-stage with Aloe Blacc on CBS on Sunday, February 3rd at the Georgia World Congress Center for the Super Bowl LIII Tailgate Party. TADA ‘s dance group consisted of a diverse group of local Atlantans with exceptionally talented men and women holding strong credits ranging from BET Network to Madonna. “When TADA was invited to perform, we couldn’t have been more excited to showcase our Pro-Dance teams’ talent,” says TADA’ s Artistic Director, Kara Jacobson. Rehearsals and planning quickly ensued and the Super Bowl performance brought additional high energy and spirit to all of the dancers in training. “To have TADA’ s dancers on stage during a Super Bowl performance was more than amazing. The energy of the crowd was fantastic and I couldn’t have been more elated about the performance the TADA Team gave,” says Jacobson. 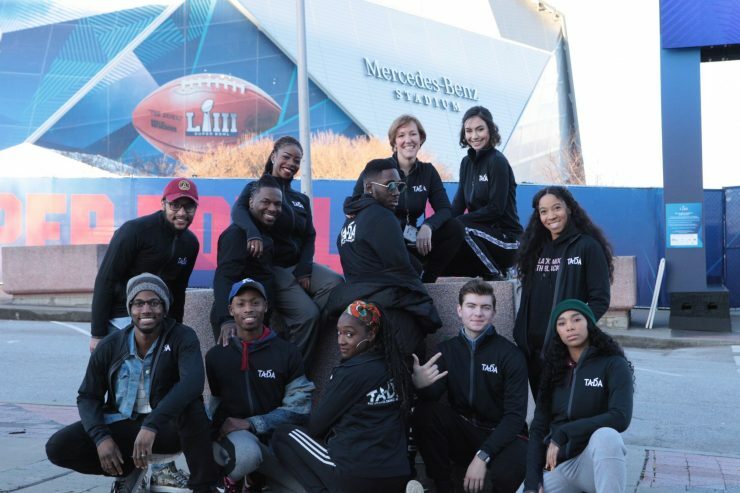 “In the two years that TADA has been open, our dancers and talent have grown far beyond my expectations and to have performed during the Super Bowl events is a huge accolade to add to our accomplishments.” TADA (The Atlanta Dance Academy) has quickly become one of Atlanta’s top-rated dance studios since its doors opened in 2016 and shows no limits with where it takes its talent. In its two years, TADA now adds a Super Bowl performance to their successful list of partnerships that include Disney Entertainment and The Rockettes. TADA partnered with The Art of the Game and Party Planners West, premier entertainment and talent agencies that worked with the NFL signature fan events for Super Bowl Sunday.